These toilet cubicle locks are the perfect choice for those requiring high-quality polished stainless steel toilet cubicle door locks. This quality product features grade 304 stainless steel outer castings for a long-lasting finish and a powder coated zinc inner plate and inner rose for corrosion resistance. In addition, the bolt and cam receivers are manufactured from the same piece of stainless steel for increased strength. This product also sports a red and white indicator to assist users with visual impairment. 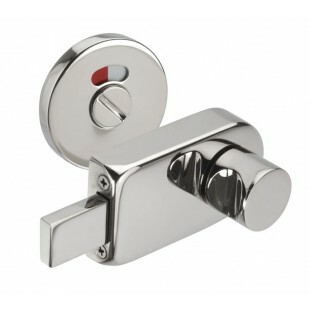 Our toilet cubicle locks are sold singly and include a bolt and indicator featuring an emergency coin release. This product also boasts a concealed fitting plate and back to back fixings to prevent vandalism and ensure a secure fit.